MPs will have the key vote in future deployments of troops to war, Justice Secretary Jack Straw has said. At present the PM and his Cabinet can sanction military action without MPs' approval - although the Commons was consulted before Iraq was invaded. Mr Straw said the government would also scrap 2005 restrictions on protests around Parliament Square. Nick Herbert, for the Tories, welcomed the proposals but said they risked being seen as "worthy but inadequate". Many of the measures set out by Mr Straw are included in the draft Constitutional Renewal Bill - although giving MPs the final say on war will be decided separately through an agreement between both houses of Parliament. Mr Straw said he wanted to move the country towards a "new constitutional settlement" and update "how power should be exercised in a modern democracy". He said he opposed making not voting in elections a criminal offence - but said elections could be moved to weekends. Other parts of the plans would mean the Attorney General having no power to give directions to prosecutors "except in exceptional cases" such as national security. He would also have to make an annual statement to Parliament. An interim rule that allows government buildings to fly the Union flag at any time would be made permanent, Mr Straw told MPs. He also set out proposals to "require the prime minister of the day to seek the approval of this House before deciding to commit forces into armed conflicts abroad". The only exceptions would be if prior approval by Parliament would jeopardise security. Special forces would also be exempt from the move. "These changes if agreed would define for the first time a clearer role for Parliament in the most critical of all decisions to face a nation," said Mr Straw. But shadow justice secretary Mr Herbert said Mr Straw's proposed reforms did not go far enough. He said: "Isn't it the case that the relationship between the people and politicians is seriously damaged and that it will require more to repair our broken politics than the measures announced today?" 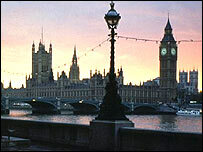 David Howarth, for the Liberal Democrats, said the proposals were "tentative first steps" towards reform. "People are losing faith in politics and that means that if we do nothing about it they will lose faith in democracy itself," he said. Mr Straw is also proposing that the Commons has more of a say in the selection of - or approval of - public officials. And the civil service values of impartiality would be enshrined in law. Mr Straw's statement is being followed by an opposition-led debate in which the Conservatives are hoping to force a vote calling for an inquiry into the Iraq war. In an earlier article for the Daily Telegraph in defence of the Union, the prime minister stressed that it is not a "contract of convenience". Mr Brown said the UK was based on a "covenant" binding together England, Wales and Scotland in a way that went beyond the material benefits to each nation. In his article he said the foundation of the Union was "shared values that have created bonds of belonging that make us all feel part of a wider Britain". Mr Brown has made "Britishness" and constitutional reform two of the key themes of his premiership. But he has also faced calls to address the perceived imbalance in power created by devolution, which allows Scottish MPs to vote on English matters such as health and education but not vice versa. Mr Straw announced the setting up of a commission, to be chaired by academic Kenneth Calman, to look at the work of a devolved Scotland in terms of both its powers and finances. It will consider whether the Scottish executive should take more responsibility for the money it spends by devolving more taxes from the UK Treasury. It is possible that this could in the future allow for changes to the controversial Barnett Formula, the complicated mechanism for calculating public spending in Scotland, which has led to it being higher per head than in England.